- Size: 7.6cm dia x 93 cm length (approx.) and 4.5 cm dia x 93cm Length (approx). - Small tube Set : Recommended for Brame. Red top. Blue Grass, Legumes. small cereal grains etc. - Large tube set: Recommended for large capacities and for grain. grasses. We are termed as one of the most reliable Dakota Type Seed Blowers manufacturers and suppliers from Ambala Cantt, Haryana. We manufacture and supply world class Seed Blowers that are termed as the best available in the market due to unique construction design and high performance. Tube Set (small): 4.6 cm. dia x 93 cm. length approx & 7.6 cm. dia x93 cm. length approx. Tube set (Large): 10 cm. dia x 93 cm. height approx. This Seed Blower is designed for Seed Test Laboratory Use. Used for purity testing, cleaning & docking of seeds/grains. This Seed Blower is Suitable for small lots/sample of seeds/grains. It has 3 sizes of columns for covering the entire range of seeds/grains. Wire mesh at bottom of column prevents seed falling into fan. - Size : 48 x 56 x 86 cm. (Approx). - Operating voltage : 220V, 50 Hz, AC. - Small Tube set : recommended for brome, red top, blue Grass, legumes, small cereal grains etc. We are manufacturer of seed blower (model no. 19). These seed blower should be an asset to plant breeders where trash or empty glumes are to be removed from small lots of seeds. 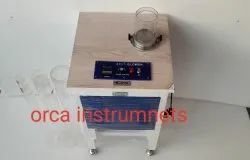 Ø Designed for purity testing docking and cleaning samples of seed and grain. Ø Makes separation by accurately controlling the flow of air upward through plexi glass columns. Ø Plexi glass columns enables the seeds to be watched during operation. Ø Fitted with 1 / 4 H.P motor, minute timer and on/off switch. Ø To work on 220 / 230 volts A.C. supply.